If you opened my freezer right now here’s what you’d see: freezer bags filled with raisin-kale muffins, chocolate graham cracker dough, whole wheat cheese cracker dough, strawberry rhubarb turnovers, whole wheat flax mini calzones, spinach pretzel bites, and the usual frozen organic meats, peas, bread, and assorted leftovers. Yes, I am that mom when it comes to feeding my kid. And you know what? Most of it she won't even eat! When I was pregnant, I had visions of all of the healthy food I’d feed my growing child—kale smoothies, roasted broccoli, sweet potato fries, plain whole milk yogurt, and the like. And for a while with solids and taking the baby-led weaning approach, much of this fantasy actually held true. My 2-year-old—like yours, I bet—has very strong opinions about everything. I do my best to give her choices so that she can participate in decision making without becoming overwhelmed, but I am still learning the best way to encourage good eating habits. I wouldn’t call her picky, but the girl has a sweet tooth (and a salty one, for that matter), and she’d happily fill up on snack food if I let her. Plus, she really likes meat, so her natural food urges are pretty far away from mine on the carnivorous spectrum. And the harder we suggest that she try a bite of this or that, the harder she pushes back. All of those posts about raising healthy eaters usually forget a key component: the will of the kid! So, on those days when her diet includes more crackers than broccoli and kale, here’s what I try to keep in mind. Don’t take it personally. Since I do most of the cooking in my house, and it’s one of the ways that I show my affection, it can hurt my feelings to offer her a meal or snack and be met with a chorus of “don’t like it!” before she even takes a bite. As much as I can, I try not to take it as an assault on my cooking abilities, and instead offer at least three components to each meal, including at least one thing that I know she likes, so that my girl can choose what to eat without too much of a power struggle. Be creative. I hate the idea of hiding “healthy” foods in tempting packaging, but I have been known to add shredded kale to muffins or pretzel bites (see my aforementioned freezer stash). I tell her what’s in there, though, and talk a lot about the color of the food since she's really into identifying everything right now. And when in doubt, I turn veggies into chips—she loves kale and sweet potato chips (yes, with salt)—or I put whipped cream cheese with a little honey onto wholesome baked goods so they look more enticing. Get them involved. I have read that letting kids help with cooking and shopping can help inspire them to try new things and I’d just like to say for the record that it doesn't always happen that way! Sure, she’s snacked on fresh snap peas and strawberries that we’ve gotten together at the farmers market, but there’s no guarantee that she’ll try what I've cooked. Still, I like it when we cook together—she likes rolling dough, cracking eggs, and stirring (and eating…) batter the most right now, so we do it regularly regardless of the outcome. Ignore other moms when you need to. We have a playdate coming up and the mom who is hosting is planning to serve popsicles. She casually mentioned that they are made with “100 percent fruit juice, no added sugar, grass-fed milk, organic yogurt, and will be allergen-free”. I am sure that she was trying to just be thoughtful, but that sort of thing can make a mom feel badly—and judged for not keeping to the same high standards at home—pretty quickly. I've decided that it’s perfectly okay to ignore other moms now and then, especially if it saves your sanity. 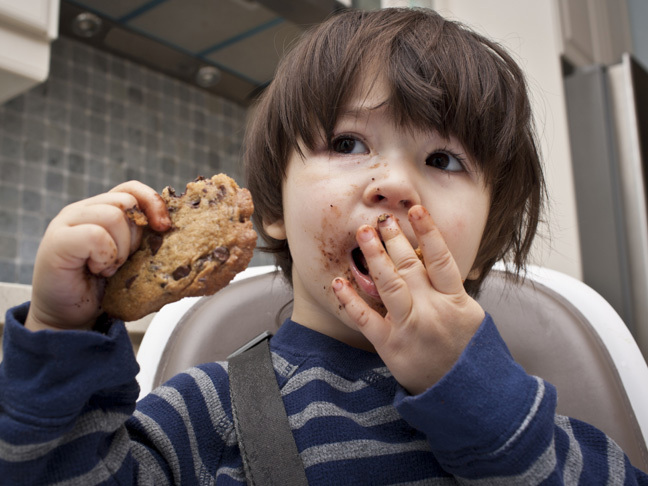 Sometimes toddlers are grumpy—regardless of their diet. If you read blogs, you have likely attributed your child’s behavior/sleep/pottying/attention/personality to their intake of sugar, juice, nonorganic produce, or GMOs, depending on the day. Frankly, sometimes our kids just have bad days, no matter what they eat. Case and point: One recent Saturday my girl had a full-on tantrum shortly after eating a bowl of ice cream at birthday party. It had been a long day and in retrospect I am sure that she was just tired and really didn’t want to leave the party. I casually mentioned to my husband that perhaps we should take a break from sugar. The next day, after a good night's sleep and a breakfast of scrambled eggs with cheese, she had another meltdown—no sugar in sight. Sometimes a toddler just has too many feelings to control. Try not to be the food police. There are days when your kid just won’t be as hungry as normal, or when they will seem to be eating everything in sight. Some days she'll eat lots of fruit and no veggies, and other days all she'll want is cucumber slices dipped in salsa. My goal is to not keep score but to trust that her diet will even out over the course of a week. I try to give her good options and to trust her and her hunger cues—so that she will learn to trust them too. And if that means that I have to eat all of the spinach pretzel bites myself, so be it.